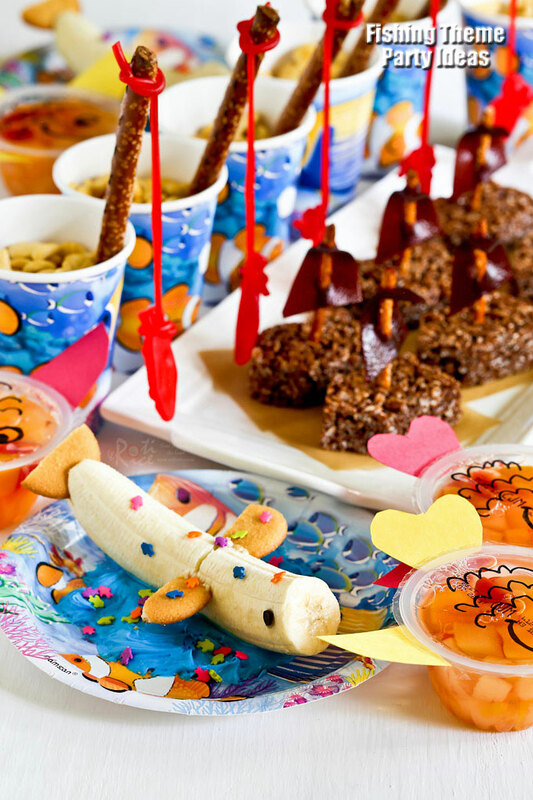 Fun, easy, and creative Fishing Theme Party Ideas for your child’s next birthday or sleep-over using convenient prepackaged treats. It is time again for Vacation Bible School at our church. For me, it means being a snack helper for the week. 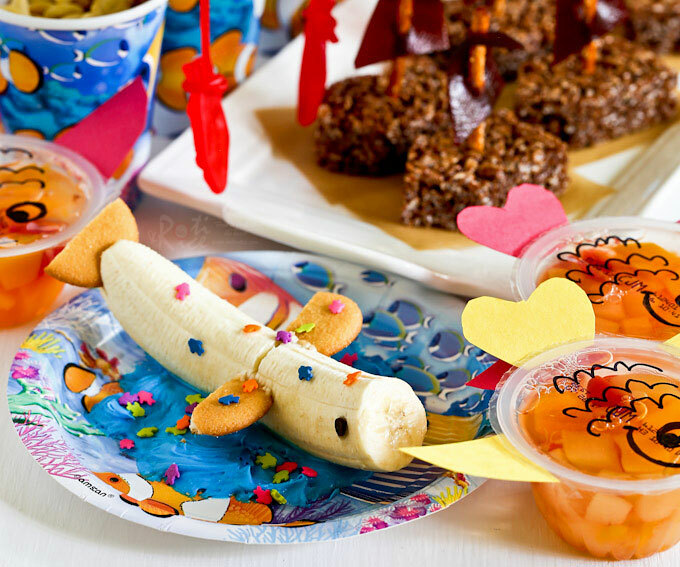 This year the theme is Deep Sea Discovery and our team leader, Sally (with some help from Pinterest) came up with a few easy, fun, and creative snacks for the kids. Since we still have a lot of summer left to enjoy, I figured that it would be fun to recreate some of the snacks. 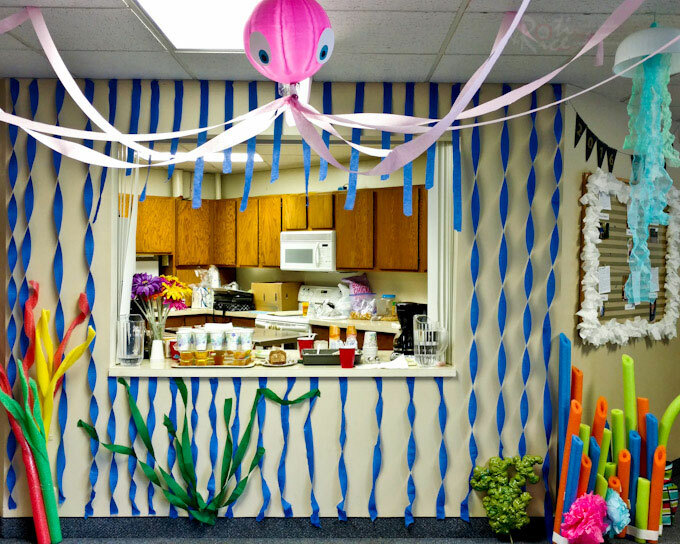 With a little creative license I put my spin on them to give you some Fishing Theme Party Ideas for the rest of summer. I hope you get to give them a try soon. For Monday, we had easy Snack Mix in Cups. 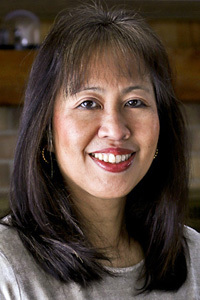 That has always been popular and it took no time at all to prepare. After the snacks were sent to the classrooms, we worked on making sailboats for Wednesday’s snacks. We melted the marshmallows and butter in the microwave. Mixed in the cereals and shaped them into boats. They were a little soft and so we had to refrigerate them for about 15 minutes to allow them to set. While waiting we prepared the sails for the boats which were made with fruit strips and pretzel sticks. 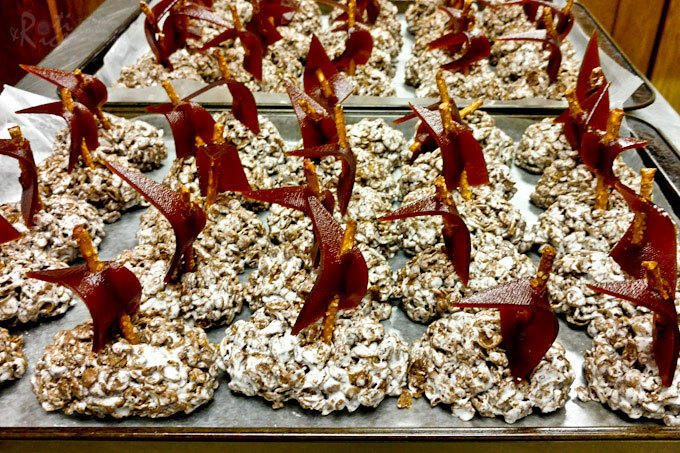 We also made the pretzel fishing poles for Friday’s snacks. 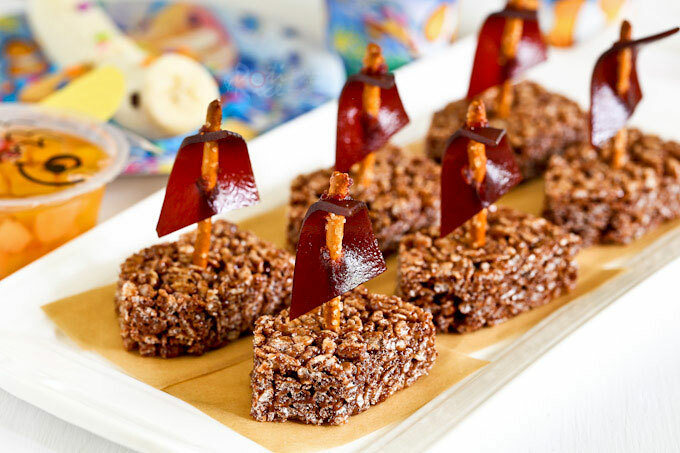 Since I was only going to make a few sailboats, these Cocoa Krispies Treats which came in a box of 8 or 16 were perfect. I cut off the corners on one end of the bar to form the bow of the boat. Using a chopstick to poke a hole in the middle, I could easily push in the sail. Otherwise, the pretzel stick may break and we don’t want that. 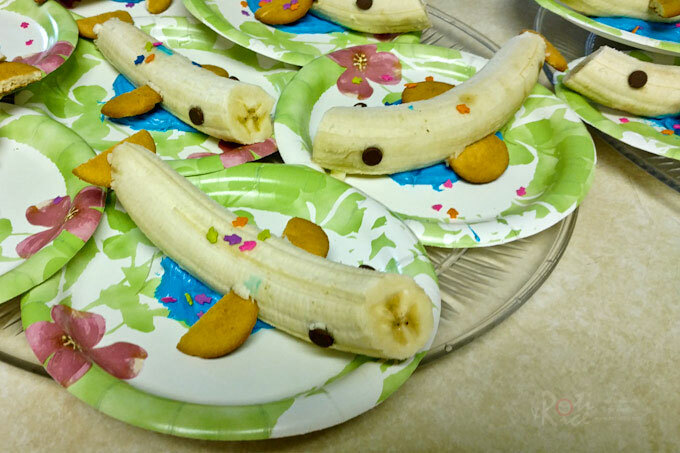 For Tuesday, we served Banana Wales made of bananas, Nilla wafers, chocolate chips, a little frosting, and fish shaped funfetti. They were so cute! I think the kids really enjoyed this snack. Which kid wouldn’t especially with the frosting and funfetti. When I made these at home, I did not change anything. I found some fun and colorful fish theme paper plates which were on sale. They were just what I was looking for. Can’t be any more spot on than that! The bananas tend to split when you push in the halved Nilla wafers but the frosting should be able to hold them in place for a while. You want to serve these as soon as possible so that the wafers do not get too soggy. 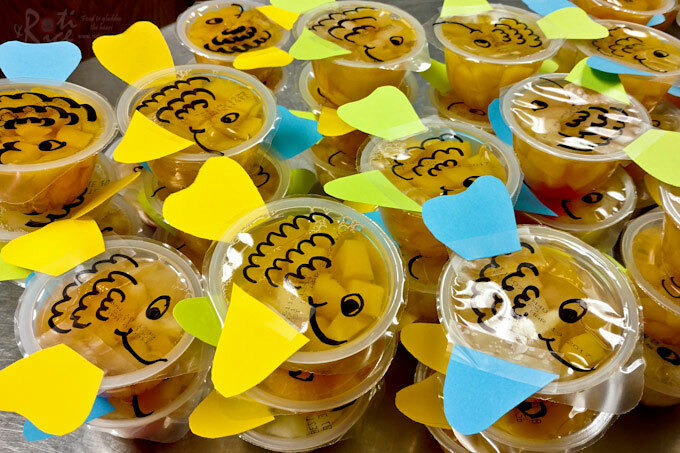 On Wednesday we worked on Thursday’s snacks – Fishy Fruit Cups. These are really easy and is more like a craft. Simply draw an eye, mouth, and scales on the top of the fruit cups. Then attach colored paper tail and fin cut-outs to the cups. One of the youth helpers suggested a single fin and we went with that. I chose to put 2 fins on the ones I prepared at home. They looked a little like ocean sun fish which are cute too. I also attached the tail and fins to the cup instead of on the top so that they would remain on the cup when the kids peel off the top plastic cover. Unfortunately, I can only find red fish gummies. It will be great if you can get fish gummies in an assortment of colors and maybe even black licorice laces. That would be perfect! Today is Thursday and VBS will be over tomorrow. Phew…the week sure went by quickly! I also made some Chocolate Chip Cookies and Banana Cream Cheese Bread for the teachers and youth helpers which I will be sharing next week. Don’t forget to check back for the recipes. 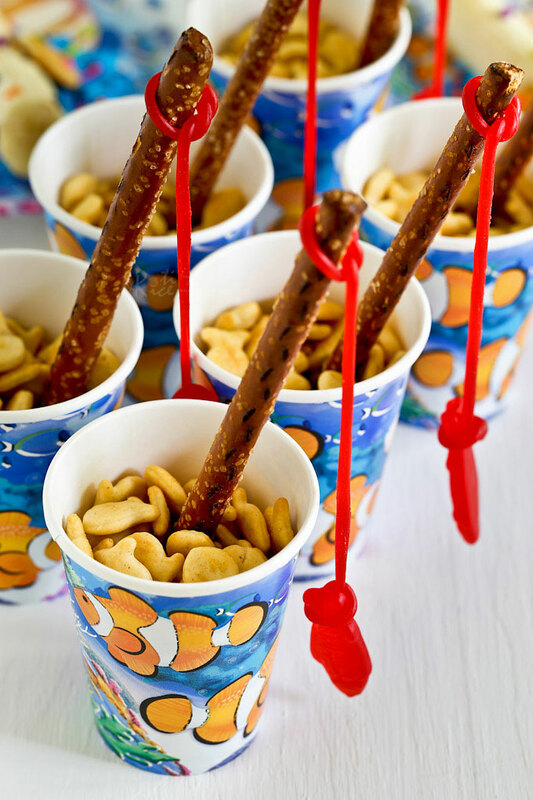 Fun, easy, and creative Fishing Theme Party Ideas for your child's next birthday or sleep-over using convenient prepackaged treats. Remove 4 packets of fruit strips from wrapper. Cut from one corner of the fruit strip to the middle on the opposite side. Do the reverse on the other end to produce 8 sails. Carefully thread each sail with a pretzel stick. Remove Cocoa Krispies Treats from packaging. Cut one end at a diagonal on both sides to form the bow of the boat. Using a chopstick or skewer, poke a hole in the middle. Stick the sail into the hole to form a sailboat. Place each sailboat on a piece of parchment paper. Spread 1 tablespoon aqua blue vanilla frosting on each of the 8 paper plates. Peel bananas and cut off about a quarter from one end of each banana. Cut Nilla wafers into halves. Stick the pointy end of 2 halves into the sides of each banana. Stick the rounded side of a halved Nilla wafer into the end of each banana to form the tail fin. Stick 2 mini chocolate chips on each side of the cut end of each banana for the eyes. Place banana whale on the aqua blue frosting. 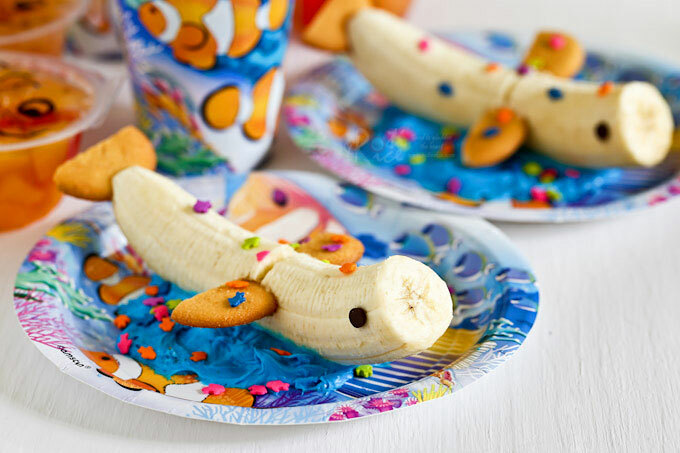 Sprinkle some funfetti over the banana whale. Draw eye, mouth, and scales with permanent black marker on the top of each fruit cup. Draw and cut out 8 fins and 4 tail fins on each of the colored paper. 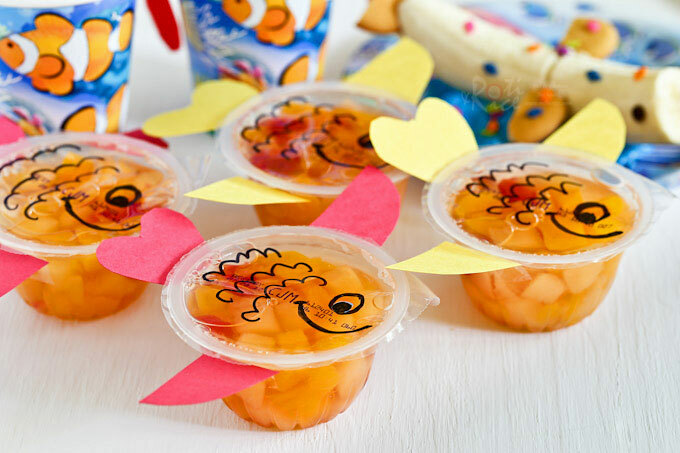 Attach 2 fins and one tail fin on each fruit cup. Peel 1 strip of Twizzler into strands. Tie a loose knot on one end of each strand. Put a pretzel through the knot. Tie another loose knot on the other end of the strand. Put the tail end of the fish gummy through the knot. 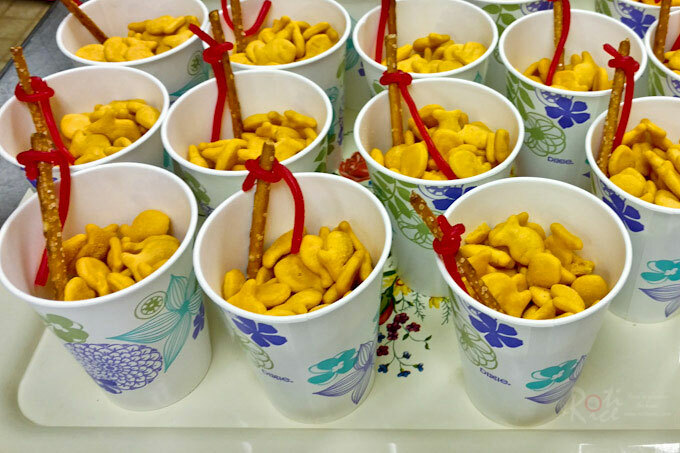 Fill each of the 8 paper cups with goldfish snack crackers. Stick a fishing pole in to each of the cups.